‘Thy Kingdom Come’ was a global prayer event. The objective is to invite Christians around the world to pray between Ascension and Pentecost for more people to come to know Jesus Christ. We were asked to help by supporting the event being held at Winchester Cathedral in Hampshire. Our task was to film before the event itself and also live stream the part in Winchester Cathedral where the Archbishop of Canterbury, Justin Welby‘s spoke and Matt Redman had a musical worship set. With it being a live stream from a location (Winchester Cathedral) rather than in a studio we undertook a pre-visit to the cathedral to check technical and logistical aspects. We also liaised with SFL PA company – the company doing all the live visuals and audio in the Cathedral – to ensure their technical setup and output format would interface to our mixing desk so we could live stream to the world. We had two technicians staffing our mixing desk and doing the video filming before the event. We started live streaming 15 minutes before the Archbishop spoke. We used a holding slide and music so online viewers could to check they could watch it before the Archbishop started talking. The stream was hosted on the Diocese of Winchester Facebook page. We were in regular contact with them beforehand meaning we had the necessary access to the account to ensure seamless production. People from all over the world listened into the stream with only a ten second delay between the event happening live and the stream. We used Facebook Live but also had a back up using our own streaming service. 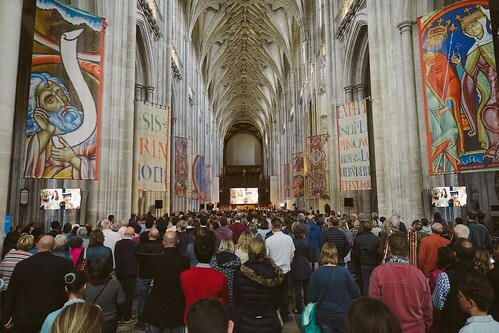 This was an amazing global event attended, in Winchester, by 3,500 people with thousands more at other cathedrals around the country and internationally. Individuals or family and friend groups could also watch from their homes on their computers, tablets or smartphones. Whilst in this case the live stream was used for a prayer meeting the technology and process could equally be used by organisations who wanted to get the message out to all staff or business partners wherever they are based in the world. It could equally be to a specially invited group of customers for a product launch or publicly to the whole world. Just imagine the saving in time, effort and cost of having your management team delivering to an audience anywhere in the UK or Internationally all at once. Just imagine you are a smaller company without regional or international offices and staff or local distributors and representatives – but with a product or service with worldwide potentially. You can now launch and market your products anywhere cost effectively. Check out some of the pictures from the event in the Flickr slideshow below.